that include spotted and ruffled flowers and flowers with contrasting edges and throats. but can also be grown in a shaded part of your garden. Unfortunately, Gloxinias are only hardy in USDA planting zones 10-12.
bring it back indooors before the first frost. 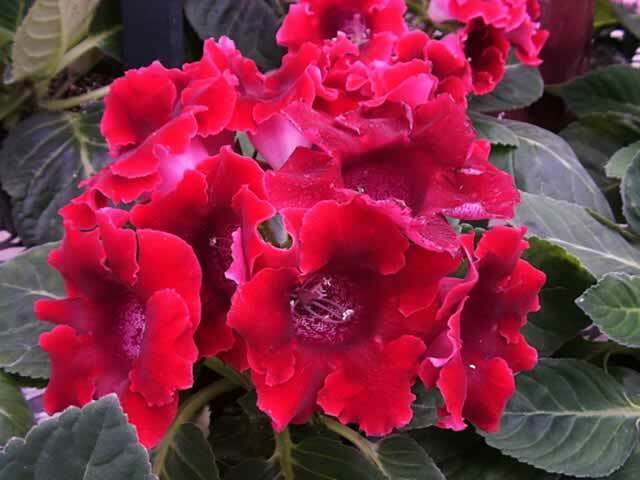 Your Gloxinia should be planted in moist, peaty soil and grown in partial shade or indirect bright light. velvety, trumpet shaped flowers tend to fill with water and collapse. The foliage will die back after blooming at which time you can dig up the tuber and allow it to dry in a frost free location. Indoors, your Gloxinia should be grown where it will receive bright light but not direct sun. They grow best in a humid area at 60°-75°. Gloxinia plants are usually purchased already in bloom, but tubers are often available from December to March. Plant the tuber (hollow side up) in a 4-5 inch pot, an inch deep in rich, light soil (a mix of loam, peat and sand works well) and water sparingly until the first leaves begin to grow. Gradually increase watering as the roots fill the pot, using care to keep the water off the velvety foliage. When the roots have filled the pot, replant it in a larger (6"-8") pot, and begin feeding it regularly with ½ strength, 'bloom' type fertilizer. The blooms will begin to appear in 3-4 months, and may last for as long as another 3-4 months. When the bloom cycle ceases and the foliage growth stops, gradually decrease watering until the foliage has died off. Store the tuber (still in its pot) in a cool dark place for 6-10 weeks, keeping the soil slightly moist. Repot the tuber after this dormant period into a larger pot with fresh soil. Gloxinias can be grown from seeds sown indoors at any time of the year. The tiny seeds require light for germination, so do not cover them! Sow them onto a bed consisting of a mixture of 1 part potting soil, 1 part peat and 1 part sand. Keep the temperature in the growing medium at 70°. Do not allow the soil to dry out at any time.